Unlimited disk space, the ability to add multiple devices to the network, backup options, and numerous security initiatives are extremely useful features to look for in a cloud based storage service. If you’re like most individuals though, you struggle differentiating between the quality cloud systems and those that it is just best to stay away from. One particular service that you may want to look into that will likely serve your needs is iDrive. To ensure that you’re making an informed decision, below is an overview of iDrive, its features and the overall consensus regarding the service. 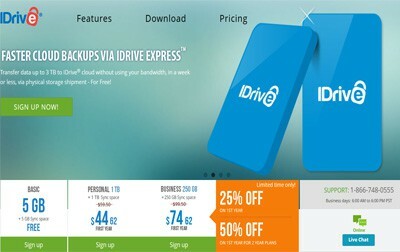 iDrive is a backup cloud storage system that is compatible with iOS, OX, windows, and even android mobile devices. Unlike some of the most standard options on the market, iDrive sports advanced capabilities and modern technology that are ideal for anyone looking for a great cloud system. Designed by Pro Softnet Corporation in 2007, the cloud storage system was created to handle every aspect that a user may think of when backing up files. One of the main disadvantages of this system, which is worth mentioning, is that iDrive is known to have cross compatibility issues. Therefore, if you are looking for this particular capability, then iDrive will stand to disappoint you. Other than that, there are still many other features that make iDrive a great choice. By ensuring that you’re choosing the right cloud based system for your needs, you can feel more confident that you’re getting what you’re looking for in a storage system. Overall, iDrive is ideal for those who own a business, are looking for advanced capabilities, and who have a lot of data that needs to be stored in an organized and ease to use manner. For most users, implementing iDrive is an extremely easy process. Below is an overview of what the system looks like after you get started. When starting with iDrive, the first question you’ll face is whether you want a default iDrive managed key or a private encryption key. The choice you make is ultimately going to depend upon your own sense of security and interests. If you choose the private key, you’ll be the only one who can access and manage your files. The only issue is losing the key. If you are prone to losing your key, you’ll have a lot of trouble gaining access to the folder. In that case, you may just want to opt for the iDrive key. Once you bypass the key, you’ll then need to download the cloud technology. The installer is extremely easy to use and it automatically adds an icon to your desktop for easy access. The next factor to take into account in your decision is using iDrive. Like most cloud based storage systems, the iDrive provides you with scheduled backups. You can schedule the backups to take place at any time. If you’re around during the scheduled backup process, you can even verify which files are being backed up by right clicking on the icon. If there are files that you aren’t interested in, you can remove those files from your next backup. 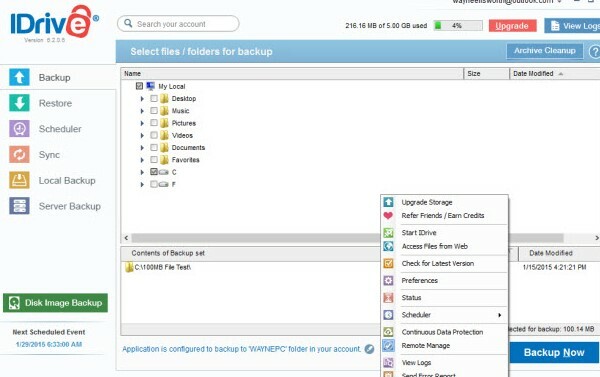 If you aren’t interested in automatic and scheduled backups, then you can also opt for manually handling the backups on your own. Either way, the speed of the entire process is fairly quick too. Out of many cloud based systems on the web, iDrive is one of the well-performing options out there. When backing up files, users can expect the backup speed to be about 1.21 minutes for 100MB of files. In addition to backing up data, iDrive also allows you to restore data. The restore feature has a number of capabilities such as searching for files, drop and drag, and review of everything that has been restored. You’ll also be glad to know that iDrive keeps an archive of all the files that you backup. With that capability, you’re getting extra protection for your files. In sum, with such a quick backup speed and extra protection for your files, you can be sure that you’re getting cloud system when you use iDrive. In addition to excellent speeds and backing up capabilities, iDrive is also one of the most functional options out there when it comes to sharing files. Through iDrive, you can share single files and whole folders. If you aren’t sharing files with an individual who also has iDrive, then you have other options. The alternative is to simply copy the URL and send it to the recipient via email or any other messaging system. You can also share the iDrive folder or file with as many users as you like, thereby making the entire system more convenient for you to use. Another promising capability is the security that you’ll find on iDrive. With iDrive, your files are entirely secure with its 256-bit AES encryption. Your user key also provides you with an extra layer of support. It is also worthwhile to note that none of your personal information, including your encryption key, is stored directly on iDrive’s website or servers. As a result, you’re data and information is much more secure. If you’re like most people, you’ve likely needed to access your files while you are on another computer or while using a different system. Fortunately, iDrive has you covered in this respect too. With iDrive, you can reach your management tools, the files that you’ve backed up, and you can even view your backup logs. These functions make things more convenient and easier for you. iDrive also provides its users with mobile access. As you can see below, the mobile application, which can be downloaded on your mobile store, is wholly user-friendly. 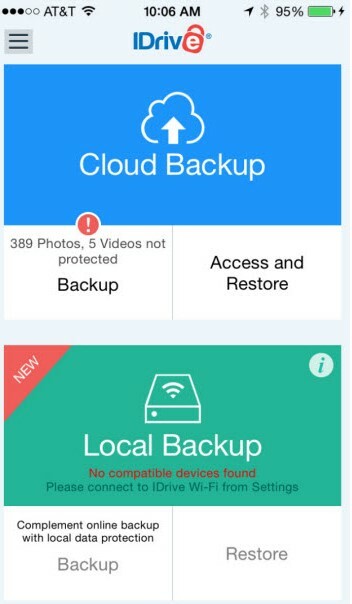 With the mobile device, available on both iOS and Android systems, you can backup from your cloud, your local drive, and you can even restore your system if needed. With these mobile functions, you can easily track your data and conduct any other moves that need to be made. The three plans, while not terribly cost-effective, are still worthwhile if you take into consideration the features that are available through iDrive. For the most part, iDrive is an advanced system that warrants the extra cost. Overall, iDrive is a very promising service that you just may want to take advantage of. With its high-quality mobile technology, the very simple interface, the reasonable cost, great speeds, and extra security features that includes the extra lawyer of support through the encryption key, iDrive offers you more than most other cloud based services. As a result, iDrive can be noted as one of the best services on the market, especially compared to even some of the other top options on the market. Provides users with many and great features allowing user to enjoy its service at an affordable price. Cross compatibility issues. Total DISASTER of a service. After a very quick initial backup I then had repeated back up failures, days without a successful backup, then a backup success out of the blue and then the next day the service kept stalling on simple files like an MP3 or a .txt file. Some times it would be doing a backup for 5 days (despite me only altering or adding 2Gb of data) which I eventually had to cancel as I wasn’t sure if it would ever stop or was stuck in some sort of self perpetuating loop – you name it the service kept failing with no discernible pattern to explain why. I kept trying to resolve the issues myself by changing the settings but after a few weeks gave up and contacted customer service. They tried to help but couldn’t resolve the issues and then after several different attempts I contacted them again and someone just thoughtlessly emailed me “uninstall and reinstall the program and do the back up again” so in disgust I decided to quit the service via email. I was then informed I couldn’t cancel the service via email so after a busy month long work period I finally rang them up and the guy told me I had to just switch auto renewal off myself and in 10 months my data would be deleted. I explained the service had never functioned since day 1 and I felt I shouldn’t have to pay for the service but he explained that in the terms and conditions I have 15 days to evaluate the produce and cancel for a full refund if I was not happy. I presume this clause is buried probably in page 18 of the T&Cs in some small print as I certainly wasn’t aware of it. I asked the guy if he read all the T&Cs in every online service he signed up for he said that he didn’t but I had to abide by them. I then asked him to delete all my data and cancel my account and he told me I had to do it myself but was at least helpful enough to explain how I could do it. He then insisted again that I couldn’t cancel my account I had to just turn off auto renewal and have an account with the dysfunctional iDrive service that I no longer wanted or used for a further 10 months. Quite how iDrive can avoid statutory consumer protection laws on selling malfunctioning products and not give refunds is beyond me. Imagine the outrage if Apple sold iPhones and put in the small print you have 15 days to evaluate the phone and beyond that period if it isn’t working you aren’t eligible for a refund. It is not just paying appropriate taxes that the tech industry are good at avoiding, it seems like it is any responsibility at all. So here I am warning potential iDrive customers on every review platform that I can find on what to expect from this service and it seems like I am not alone. Ironically I changed to iDrive from Crashplan (which worked perfectly until I changed country when it would fail for a week or two) because there customer service was slow but at least their service actually functioned 95% of the time and when I did cancel my monthly plan they refunded me the money for a month because their wasn’t a back up for a couple of weeks. I believe that is called customer service. I now know why iDrive force you to pay for a year upfront. Anyway after unsuccessfully trying cloud back up for over a year now I am now just buying a second hard drive to backup all my data alongside my normal back up hard drive. I will then store the drive off site in case of fire, theft or whatever. It looks like cloud storage still has a way to go.